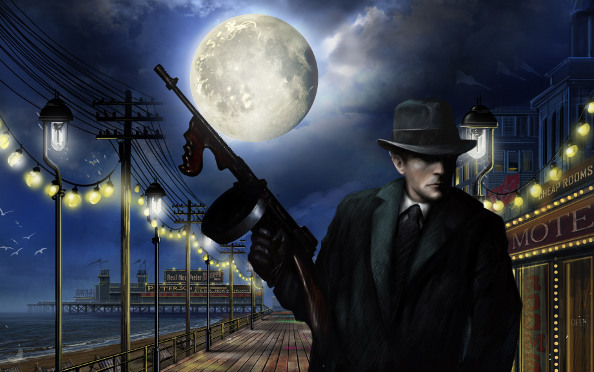 Omerta: City of Gangsters is a mob-themed strategy/management game set in Prohibition-era Atlantic City. In your quest to become Mr. Big, you engage in everything from running speakeasies distilleries to breaking into banks. It draws its inspiration from the likes of Tropico, and even XCOM and Jagged Alliance. It’s a multi-tiered strategy game that promises all the jazzy style and swaggering violence of Boardwalk Empire or a Jimmy Cagney movie, but it sometimes struggles to bring that across. 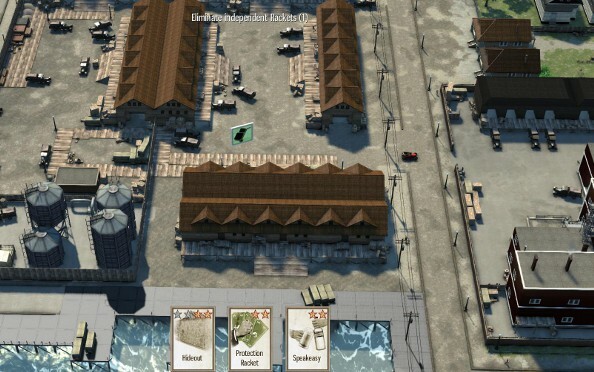 Omerta has both a strategic layer and a tactical layer. You’ll spend most of your time in the strategic mode, which takes place on a map that covers a single area of Atlantic City, and each which is supposed to be authentic to the time period. In the story, you work your way up district-by-district as you strive to become the new big cheese. Most of the individual maps will have their own objective, which will focus on something specific like gaining the rights to an old abandoned factory or soliciting the services of a renowned gangster. Every neighbourhood has different sorts of buildings that fill different roles. Joints and Premises can host illegal businesses – like a brewery or a speakeasy, or even legal ones like a medicine store. Residences are good targets for burglaries, or you can buy and rent them out to generate more “clean” money. There are also independent businesses and competitors that you have to deal with, one way or another. You can buy them out, send in your goons to shut them down, or find other ways to exploit them. Other unique buildings like Police Stations and Politician’s houses also have their own purposes, especially when it comes to avoiding a criminal investigation by the cops should you draw too much attention to yourself. To help you run your criminal empire, you can gather a posse of five other gang members who can all have different specialisations – like burglars, masterminds, hitmen, etc. As you play through the game, your gang will level up, improving their stats and abilities, and new potential gang members will become available. 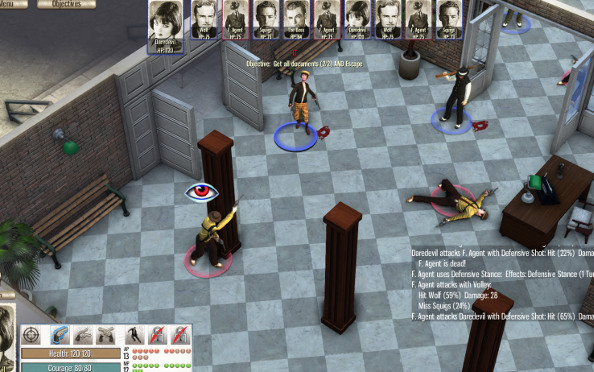 The classes all relate to the type of missions that are available in the game: Burglars can get more loot from a robbery; Hitmen can do illegal actions without drawing any attention, and so on. A ‘mission’ can be anything from simply buying a building, to selling your wares, to breaking into a police station. Some missions are ‘aggressive’, some are passive or merely transactions – not all of the aggressive missions are combat missions, but nearly every mission can force you into a combat scenario should something go wrong. That’s when you enter the tactical mode. The tactical interface is really where the XCOM and Jagged Alliance inspiration comes in. Whenever a mission leads to a combat scenario, you have to choose your team and battle it out on a turn-based tactical map. Your team typically consists of up to four gang-members, with an additional fifth gang-member in an off-map ‘support’ role. Tactical maps aren’t quite boilerplate, but certain location-types can seem familiar if you fight in them regularly enough. Omerta has all the hallmarks of a classic tactical-combat game though – turn orders (based on speed), cover, line-of-sight. Typically, combat missions are your gang versus a group of enemies – whether they be rival gangsters or the police, but some combat missions will be objective based, which does mix things up a bit. Your gang members have a range of combat options available to them based on the weapon they use, and you need to use the environment and everyone’s abilities to plug away at your foe until either they’re all dead. Several things can happen to your team members as the result of a combat mission, especially if you lose. Team members can be critically injured, which will affect stats and abilities, and they can also be knocked unconscious (but not killed). If you lose, team members can even be imprisoned, which will mean you either have to pay their bail, bribe someone, or launch yet another combat mission to break them free. Therefore, combat missions always carry a certain element of risk – even if your characters are of a high level and have many abilities, one bad hit could finish them as an effective member of your gang. So far, while the game *seems* interesting, it may be too simple. The economic element is basic supply and demand and doesn’t require much thought. Even when a police investigation is triggered, it can be pretty simple to deal with. All in all, the strategic level is pretty easy once you attain critical mass. Sure, on harder difficulties or neighbourhood’s, it can be genuine struggle to keep the money coming in and manage expansion. But once that ball starts rolling, ultimate victory becomes a matter of ‘when’, not ‘if’, and the snowball effect can be pretty rapid. These issues are amplified in the skirmish/sandbox mode, which isn’t as strong as the campaign. A skirmish game takes place on one of four neighbourhoods that you can choose from, which each have their own theme and difficulty. These pretty much play the same as normal map except that there’s no real goal or purpose to playing. You simply keep going until you get bored or there is nothing left to do. It doesn’t seem to take long to get to that point either, as we smashed through one of the easier choices in only a few hours. Once we found ourselves in control of all the businesses, with no competition and nothing left to physically ‘do’, all that was left was to watch our money piles increase. The campaign mode technically suffers from this problem too, but since there is a goal or an objective to achieve, maps come to a good ending and then it’s on to something new. For the moment then, the campaign appears to be where the action is. The narrative harks back to classic gangster themes and comes with its own twists and turns, although it’s dealt with in such a brisk fashion that you may miss what’s going on. There is a multiplayer element to the game, but it only involves the tactical combat layer. Much like XCOM, you can set up a team before you enter a match. You start off with four basic gang-members, but you can unlock more by spending money that you earn through winning matches. You can also spend money to unlock new and better weapons for your gang to use, and, much like single-player, your multiplayer gang will level up and learn new skills and abilities. At the moment, there are only two competitive modes, gang vs. gang, and two co-operative game modes where you team up with someone else to complete the objective. I’d have expected more natural charm from a game that’s by the creators of Tropico, but the period music and wonderfully stereotypical gangster-sounding accents do help set the mood, even if you feel more like an accountant than a mob boss at times. Don’t count this game out just yet though – it may not appear to be as strong as some of its inspirations so far, but all the basics are there. It just needs a little jazzing up. 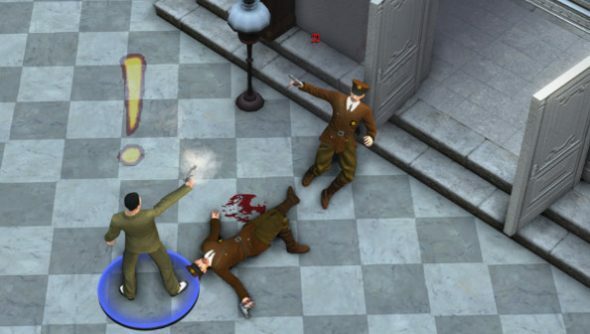 Omerta: City of Gangsters is due in February 2013.